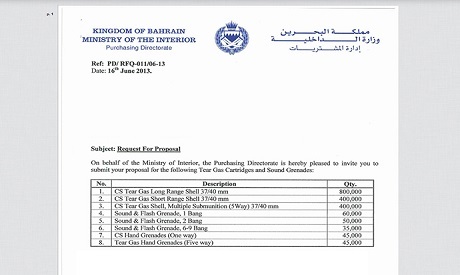 A leaked document from Bahrain's interior ministry detailing a request for a tear gas and grenade shipment has set off an online Bahraini campaign calling for the shipment's halt. "Stop the Shipment" was launched on 17 October by a bevy of activists from Bahrain Watch, an independent UK-based research and advocacy organisation. The tender document, penned on 16 June, invites proposals for the provision of 1.6 million canisters of tear gas, 145,000 stun grenades, 45,000 hand grenades, and another 45,000 tear gas grenades. The request asks supplying companies to submit proposals to the ministry by no later than 16 July. Campaigners suspect that likely bidders include South Korea's DaeKwang Chemical Corporation and CNO Tech, Korea Defense Industry (KDI), and a joint South African-German company called Rheinmetall Denel. Based on field evidence the organisation collected between 2011 and 2013, the top teargas exporters to Bahrain are DaeKwang Chemical Corporation and CNO Tech. Both companies have shipped "over 1.5 million pieces of tear gas to Bahrain between 2011 and 2012," which exceeds "the entire population of Bahrain, which is 1.2 million, of which 600,000 are citizens," according to the group's website. Financial Times cited a senior executive at DaeKwang as acknowledging the export of around one million units of tear gas to Bahrain between 2011 and 2012. "Stop the Shipment" hosts an email-writing campaign and a story-sharing page where supporters can tell their stories of teargas encounters. So far, over 30,000 emails have been sent to complicit companies and authorities. "Our immediate aim is to generate enough public pressure on the tear-gas producing companies to cancel the shipment described in the leaked tender document," Bahrain Watch member Fahad Desmukh told Ahram Online. "Beyond that, we are hoping to raise awareness about the well-documented, widespread human rights abuses carried about by Bahraini security forces on the population." Since the 14 February uprising, teargas in Bahrain has been used frequently, and often lethally, by security forces. Thirty-nine people have been killed by teargas since 2011, according to the International Physicians for Human Rights NGO. Most casualties have resulted from lung failure after exposure to teargas fired inside homes. Others have died from blows to the head. "Tear gas canisters usually come with warnings that they should not be used in closed areas, and that they should not be fired directly at a person," Desmukh said. However, video and witness testimonies attest to the contrary. "There are dozens of videos posted on YouTube showing police officers firing tear gas inside houses, inside cars, and in the more bizarre cases, inside a coffee shop, a beauty salon and in a female religious centre. Sometimes whole neighbourhoods have been drowned in tear gas by firing dozens of canisters in the span of a few minutes," Desmukh continued. A Bahrain Watch video documents how tear gas is misused in Bahrain, showing clips of houses shrouded in smoke, of people escaping their homes in terror, and of teenage teargas victims. "Teargas in Bahrain is used as a form of collective punishment," the video asserts. Teargas has found a growing market in Arab countries, where it is used excessively and indiscriminately to disperse protests. According to Amnesty International, Turkey's police requested some 100,000 teargas canisters during anti-government protests in May. Egypt's interior ministry ordered 140,000 teargas canisters in January 2013. This is an increase from the comparatively small 21 tons of tear gas grenades and canisters – enough for 40,000 rounds – supplied by the US during the 25 January uprising. Tunisia and Israel are among the top importers of teargas. Although Bahrain Watch has not yet received an official response from the government or the tear gas companies, others have come to the campaign's support. The Korean Federation of Trade Unions has sent a letter to the Korean government asking it to refuse export licenses to companies dealing with Bahrain. The involved companies could not be reached for comment by Ahram Online.